Coilintra Cottage is a one and a half storey 3 bedroom traditional stone cottage in need of full restoration which has full planning for the construction of a single storey side extension to the existing dwelling house. The property offers a truly unique opportunity to acquire spacious accommodation amidst wonderful surroundings in Grantown On Spey within the Cairngorms National Park. This property is ideally located in a private and tranquil location within walking distance of the town centre and local amenities and set in approximately 0.27 acres of garden grounds. The current accommodation is arranged over two floors and consists of a lounge, family room, kitchen / dining room, store room, family bathroom and three bedrooms. The plans for the extended accommodation provides great potential to own an incredible home in this friendly town, viewing is recommended. This property is exempt from a home report as it is uninhabitable. Entry is through double timber doors into the bright entrance vestibule where a window to the front allows in great natural light. The hallway provides access to the lounge, and family room and stairs provide access to the first floor. There is ceiling lighting. A well proportioned lounge benefitting from a window to the front that allows for lovely views over the garden. There is a fireplace, storage cupboard and ceiling lighting. A spacious room enjoying a window to the front looking out over the spacious garden grounds. There is a fireplace, ceiling lighting and a high level electrical switchboard. This sizeable kitchen / dining room benefits from a window to the front and rear providing excellent levels of natural light and a timber door provides access into the garden. There are wall shelving units and ceiling lighting. With a window to the rear allowing in natural light. 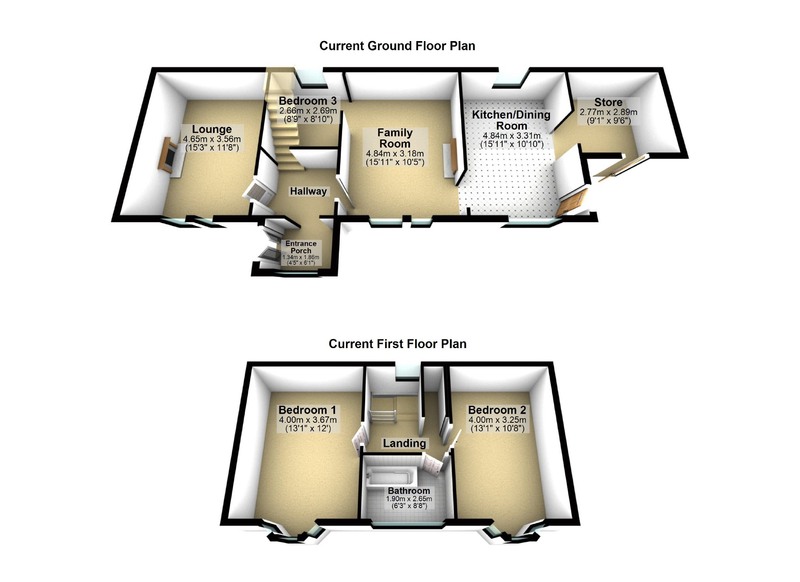 This room could be extended into the family room to create a spacious bedroom with dressing room or en-suite. Accessed from the kitchen / dining room and benefitting with a door opening directly into the garden, this room would make an excellent utility room. The landing provides access to bedroom one, bedroom two and the bathroom. A Velux window to the rear allows in natural light and there is a cupboard and wall lighting. 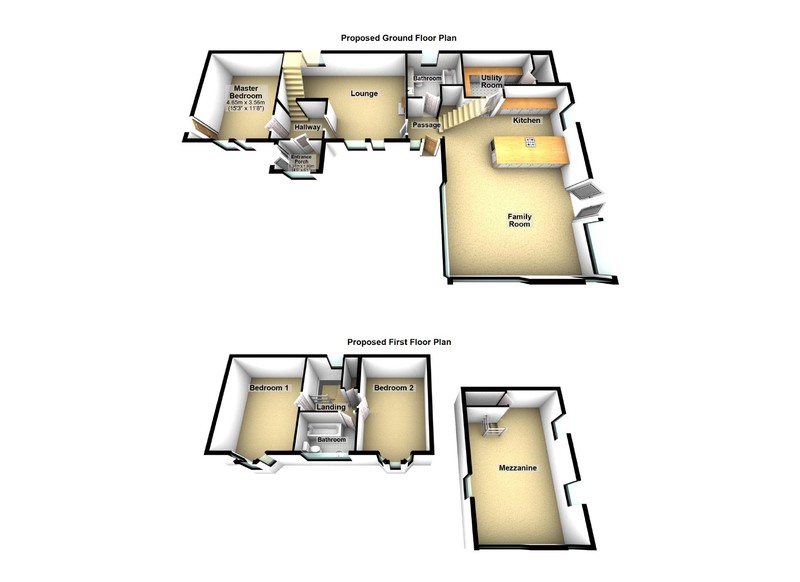 A spacious double bedroom benefitting from a bay window to the front overlooking the garden. There is a fireplace. This double bedroom enjoys a bay window to the front overlooking the spacious garden grounds and there is a fireplace and ceiling lighting. The bathroom benefits from three windows to the front which allow in great natural light. There is ceiling lighting and a bath. The spacious garden grounds extend to approximately 0.27 acres and are laid to lawn and bounded by a combination of beautiful natural stone wall and post and wire fencing. Access is at the side of the property from Dunstaffnage Brae. It is understood that the property is served by mains water, electricity and drainage. A home report is not required for this property as it is uninhabitable.